Tonight's dinner is a creation by my husband which has morphed over the years. It began when a friend told me that she loved to mix macaroni and cheese with hamburger and a can of diced tomatoes. My husband thinks everything can be improved with Rotel and wanted to try it with the cheesy Rice-a-Roni and that is how we made it for years. 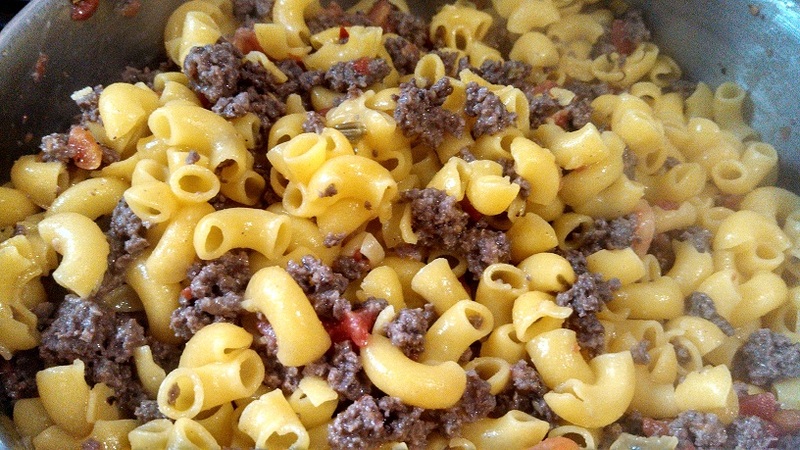 Since going gluten and dairy-free, the hamburger, Rotel and Rice-a-Roni has been out of the meal rotation, then a couple weeks ago my husband asked if we could mix Rotel and goat cheese together with hamburger and either gluten-free macaroni or rice. I was a little nervous but I shouldn't have been seeing as Rotel and ground beef are a magical combination. I'm quite happy with how this dish turned out and found myself looking forward to having it again. My husband named the dish and is insisting on bringing the interrobang back into fashion. If you don't know what the interrobang is, here's a link: Interrobang. 1. Brown ground beef and season with pepper, garlic powder and onion powder. We don't salt the meat because there is sodium in the Rotel. 2. While the meat is browning, cook pasta according to directions. 3. Once hamburger is browned, combine almond milk with cornstarch and add to hamburger with Rotel and goat cheese. Cook until everything is combined, add pasta and toss everything together.